The gradual shift toward customized care has led many providers to look at patient problem lists in a new light. Since they provide a snapshot of a patient’s medical condition, the lists typically are used as point-of-care tools, but they could potentially play a more transformative role. Many HIT professionals believe problem lists will not only be useful for decision support but also for developing best practices and improving the care of entire health populations. Holland says organizations must determine how they intend to use problem lists. Providers typically have looked at them as point-of-care tools, but many now are considering them for decision support, registries, and identifying best practices. Narrow the list’s focus, and it’s easier to decide the type of information to include. Once the list has been defined, it’s essential to establish who has access and who is responsible for maintenance. In ambulatory settings, a primary care physician typically is responsible for managing the list, while a hospitalist usually handles the task in a hospital setting. However, because specialists often see patients while they’re in the hospital, maintaining an effective workflow can be challenging. Specialists focus on the problem-list items that pertain to them, increasing the chances of important information falling through the cracks. Ownership issues relating to problem lists especially are challenging because patient information can change frequently. There must be a clearly defined process for adding and updating information. One common problem is that temporary conditions often are not removed when they no longer apply. Holland says developing a consistent problem-list workflow requires a significant amount of buy-in from all stakeholders involved in patient care. Because problem lists are one of the objectives covered by meaningful use rules, more are being digitized. This has presented providers with an interesting set of new problems. To meet the objective of maintaining an up-to-date problem list of current and active diagnoses, the Centers for Medicare & Medicaid Services requires that more than 80% of a provider’s patients have at least one structured data entry on their problem list or an indication that there are no problems. However, structured data require standard terminology, meaning diagnoses will most likely need to be coded. Holland says physicians traditionally have resisted using codes for problem lists, but most now accept the need to do so. While there is no industry consensus for how to encode problem lists, AHIMA supports the use of SNOMED CT in EHRs. In addition to medical uses, coded problem lists also can help reimbursement coders. AHIMA recommends that problem lists be used only as an adjunct to reimbursement coding and not as a final diagnosis set because the recording of problems may be slightly different than completed diagnostic statements because of the timing of entries. While physicians have long been employing problem lists to guide patient encounters, newer uses with the potential to greatly improve patient care have emerged. Take decision support, for example. Rules can be programmed into an EHR to remind providers of important preventive, diagnostic, and therapeutic considerations, such as when certain vaccinations are due for a condition on the problem list, what test may be required to follow up on a listed condition, or when certain therapies may be contraindicated because of a condition on the problem list. Hardeep Singh, MD, MPH, an informatics researcher at the Houston VA Health Services Research and Development Center of Excellence and an associate professor of medicine at Baylor College of Medicine, says these types of functions are highly dependent on accurate problem-list data and structured data in a computer-recognizable format. “If the data are accurate, the computer can really help us make better clinical decisions,” he says. Although excessive alerts and reminders can cause workload fatigue, Singh says designing workflows that get everyone on the health care team involved in the maintenance and use of problem lists can alleviate some of the burden on physicians. In addition to nurses and allied health staff, the team can be expanded to include patients. Scichilone, who considers patient involvement to be health care’s “missing link,” believes patients are an untapped resource. Because patients are visiting more providers than ever before and the majority of problem-list maintenance is performed at the time of the encounter, it is increasingly important to get patient input to ensure accurate records. Patients often can recognize problem-list inaccuracies before clinicians, which can improve care and reduce medical errors. Also, discharge instructions are based on the problem list, and meaningful use rules mandate greater transparency and patient access to medical data. Beyond the benefits of treating individual patients, problem lists may help improve care among entire populations. Patients with the same medical condition, such as diabetes or high blood pressure, can be grouped into registries that allow providers to target specific therapies to specific populations through EHR programming rules. For example, Singh cites a study that found patients with heart failure on their problem lists received more effective treatment for that condition. Researchers also are looking at ways to data mine problem lists to track treatment and outcomes. Such information could potentially revolutionize best practices as well as catch problems sooner and reduce complications. However, it will be practical only when interoperability reaches a point where more systems in and out of the hospital are connected. It may take a while before problem lists can be widely used for process improvement, but the experts agree that there are steps to make the tool more useful right now. Clearly defining what goes on the list, who can contribute content, and who is responsible for its management are solid first steps. Greater standardization and interoperability are also essential; the lists need to be available to all providers as well as patients to achieve maximum benefit. 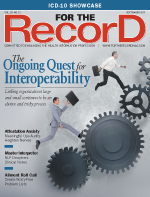 “If we can have a very nice, clean problem list within our organization for each patient, then when we look to merge data that we’re getting from outside sources, either through claims data, HIE [health information exchange], or other EHR systems with direct feeds, then we have something to compare that against,” Holland says.